The techno-rock band, MGMT, released a new more intimate sound in the new album “Congratulations” this past month. Compared to their hit CD “Oracular Spectacular,” their creation produces a peculiar melody accompanied by toe-taping beats with excellent vocal stimulation. The eight tracks shred all ideas that MGMT would continue in their old ways. Formed in 2002, the bands’ front man Andrew Vawyngarden continues to captivate the most attention of the two bandmates, with his unique voice that puts listeners in a trance like state. Once relying upon solid bass lines and computer-generated noise, the band has revolutionized its style into a even more homophonic texture. The evidence is expressed in some of the band’s tracks with new use of a contemporary acoustic guitar. The first MGMT CD was geared for radio listeners, but provided enough revenue for them to explore and construct a resonance that better describes their style. They now play with a variety of instruments, and possibly use their innovative technique to attract a diverse audience. The band strives to be so different they insert too many random noises and odd harmonies, in which they lose pure simplicity. If there were ever an album that was constructed to be lyrically concise, this would be it. 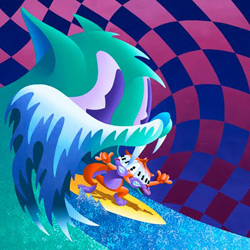 MGMT sings a song titled “Song For Dan Treacy” that offers the lyrics, “No rest for the mind that’s seen it all before.” The album personifies sorrow and amplifies uncertainty. The CD’s most impressive track is “Siberian Breaks.” Compared to the band’s others, it’s tamed, yet the most lyrically apathetic of all. This work of art provides endless possibilities to multiple listeners, but because of its unconventional tempo and melody the sound places the piece far from being an instant classic.